2003-09-15 Assigned to APPLERA CORPORATION reassignment APPLERA CORPORATION ASSIGNMENT OF ASSIGNORS INTEREST (SEE DOCUMENT FOR DETAILS). Assignors: OLDHAM, MARK F., YOUNG, EUGENE F.
2013-08-21 First worldwide family litigation filed litigation Critical https://patents.darts-ip.com/?family=43706207&utm_source=google_patent&utm_medium=platform_link&utm_campaign=public_patent_search&patent=US20040009586(A1) "Global patent litigation dataset” by Darts-ip is licensed under a Creative Commons Attribution 4.0 International License. The present application is a continuation-in-part of U.S. patent application Ser. No. 10/216,620, filed Aug. 9, 2002, which is a continuation of U.S. patent application Ser. No. 09/700,536, filed Nov. 29, 2001, which is a National Phase Application Under 35 U.S.C. § 371 of PCT International Application No. PCT/US99/11088, filed on May 17, 1999, which claims benefit from U.S. Provisional Patent Application No. 60/085,765, filed May 16, 1998, and from U.S. Provisional Patent Application No. 60/092,784, filed Jul. 14, 1998. U.S. patent application Ser. No. 10/370,846, filed Feb. 20, 2003, is a related application. All of the above-identified applications are incorporated herein in their entireties by reference. FIG. 9 is a flow chart for computing ratios between the plurality of reference emitter segments of the reference member of FIG. 4. “Nucleobase” as used herein means any nitrogen-containing heterocyclic moiety capable of forming Watson-Crick hydrogen bonds in pairing with a complementary nucleobase or nucleobase analog, e.g. a purine, a 7-deazapurine, or a pyrimidine. Typical nucleobases are the naturally occurring nucleobases such as, for example, adenine, guanine, cytosine, uracil, thymine, and analogs of the naturally occurring nucleobases, e.g. 7-deazaadenine, 7-deazaguanine, 7-deaza-8-azaguanine, 7-deaza-8-azaadenine, inosine, nebularine, nitropyrrole, nitroindole, 2-aminopurine, 2-amino-6-chloropurine, 2,6-diaminopurine, hypoxanthine, pseudouridine, pseudocytosine, pseudoisocytosine, 5-propynylcytosine, isocytosine, isoguanine, 7-deazaguanine, 2-azapurine, 2-thiopyrimidine, 6-thioguanine, 4-thiothymine, 4-thiouracil, O 6-methylguanine, N6-methyladenine, O4-methylethymine, 5,6-dihydrothymine, 5,6-dihydrouracil, 4-methylindole, pyrazolo[3,4-D]pyrimidines, “PPG”, and ethenoadenine. Sugars can have modifications at the 2′- or 3′-position such as methoxy, ethoxy, allyloxy, isopropoxy, butoxy, isobutoxy, methoxyethyl, alkoxy, phenoxy, azido, amino, alkylamino, fluoro, chloro and bromo. Nucleosides and nucleotides can have the natural D configurational isomer (D-form) or the L configurational isomer (L-form). When the nucleobase is a purine, e.g. adenine or guanine, the ribose sugar is attached to the N 9-position of the nucleobase. When the nucleobase is a pyrimidine, e.g. cytosine, uracil, or thymine, the pentose sugar is attached to the N1-position of the nucleobase. As used herein, the terms “polynucleotide” and “oligonucleotide” mean single-stranded and double-stranded polymers of, for example, nucleotide monomers, including 2′-deoxyribonucleotides (DNA) and ribonucleotides (RNA) linked by internucleotide phosphodiester bond linkages, e.g. 3′-5′ and 2′-5′, inverted linkages, e.g. 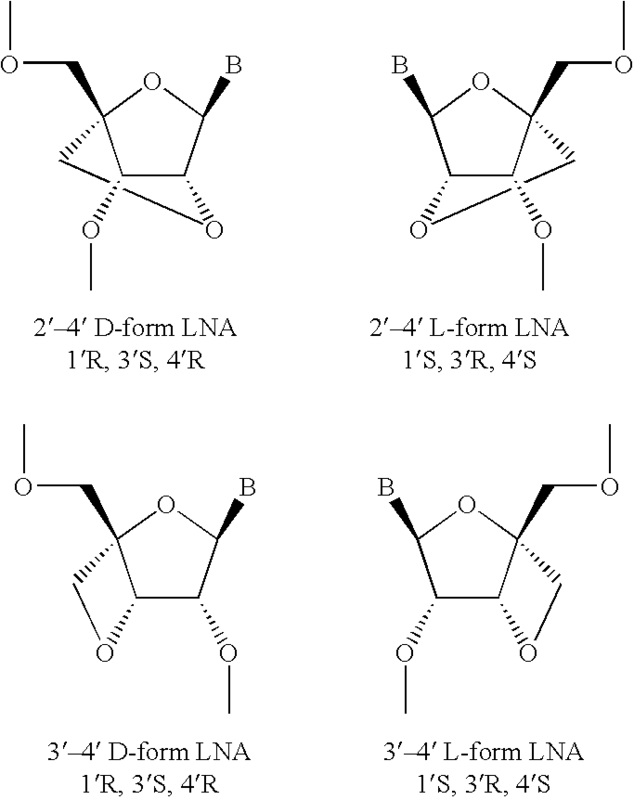 3′-3′ and 5′-5′, branched structures, or internucleotide analogs. Polynucleotides can have associated counter ions, such as H +, NH4 +, trialkylammonium, Mg2+, Na+ and the like. A polynucleotide can be composed entirely of deoxyribonucleotides, entirely of ribonucleotides, or chimeric mixtures thereof. Polynucleotides can be comprised of internucleotide, nucleobase and sugar analogs. For example, a polynucleotide or oligonucleotide can be a PNA polymer. Polynucleotides can range in size from a few monomeric units, e.g. 5-40 when they are more commonly frequently referred to in the art as oligonucleotides, to several thousands of monomeric nucleotide units. Unless otherwise denoted, whenever a polynucleotide sequence is represented, it will be understood that the nucleotides are in 5′ to 3′ order from left to right and that “A” denotes deoxyadenosine, “C” denotes deoxycytidine, “G” denotes deoxyguanosine, and “T” denotes thymidine, unless otherwise noted. “Internucleotide analog” as used herein means a phosphate ester analog or a non-phosphate analog of a polynucleotide. Phosphate ester analogs can include: (i) C 1-C4 alkylphosphonate, e.g. methylphosphonate; (ii) phosphoramidate; (iii) C1-C6 alkyl-phosphotriester; (iv) phosphorothioate; and (v) phosphorodithioate. Non-phosphate analogs can include compounds wherein the sugar/phosphate moieties are replaced by an amide linkage, such as a 2-aminoethylglycine unit, commonly referred to as PNA. In a thermal nucleotide amplification reaction, for example, PCR, the reaction apparatus (FIG. 1) can be conventional and can include two main components, namely a thermal cycler block  1 with wells 1 a for holding at least one vial 1 b containing a suspension of ingredients for the reaction, and a thermal cycle controller 1 c for cycling the temperature of the block through a specified temperature program. The starting ingredients of the aqueous suspension of sample materials can include a “seed” sample of a nucleic acid sequence, selected nucleic acid sequence primer strands, nucleic acid sequence elements, nucleic acid sequence fragments, enzymes, other chemicals, or a combination thereof. The block, for example, aluminum, can be heated and cooled in a prescribed cycle by an electrical device, liquid or air coolant devices, or a combination of these, or other devices to achieve the cycling. The suspensions in the vials can be cycled between two temperature phases so as to effect the thermal nucleotide amplification reaction. These phases can be a lower temperature extension phase for the PCR reaction of about 60° C., which can be the phase where all of the nucleic acid sequence strands have recombined into double strands. A high temperature denaturing phase at about 95° C. can be part of the PCR reaction, during which the nucleic acid sequence can be denatured or split into single strands. According to various embodiments, the vials can be formed conically. The vials can be formed in a plastic unitary tray. The tray can contain a plurality of vials, for example, 96 vials in an array of 12 by 8. The tray can be removable from the block for preparations. A plastic unitary cover with caps  1 d for the vials can rest or attach over the vials to prevent contamination and evaporation loss. Other devices can be used for this function, for example, oil on the sample surface. If other devices are used to cover the tray, the vials caps may not be necessary. The caps can be transparent to light utilized in the instrument, for example, the excitation frequency. The caps can be convex. The caps can face towards the light source or upwardly. According to various embodiments, the monitoring instrument can be mounted over the block containing the vials. The instrument can be removable or swing away for access to the vials. In the bottom of the instrument, a platen  2 can rest over the vial caps or, if none, directly over the vials. The platen can be metal, for example, aluminum. The platen can include an array of holes 2 a therethrough aligned with the vials. Each hole can have a diameter about the same as the vial top diameter. The platen can have its temperature maintained by a film heater or other devices for heating the platen. When caps are used, the heating can be controlled to prevent condensation under the caps without interfering with nucleic acid sequence replication in the vials, for example, by holding the platen at a slightly higher temperature than the highest sample temperature that the thermal cycler reaches. As depicted in FIG. 1, above each of the vials, a lens  2 b can be positioned such that its focal point is approximately centered above the suspension in the vial. Above these lenses, a field lens 3 can be provided as a telecentric optical system. According to various embodiments, the field lens 3 can be an aspherically corrected Fresnel lens for minimal distortion. A neutral density pattern (not shown), to correct nonuniformities in illumination and imaging, can be mounted on or in proximity to the field lens, for example, to attenuate light in the center of the image field. A folding optical mirror can be optionally mounted, for example, at 45°, for convenient packaging. The folding optical mirror can be omitted, or other folding optics well known in the art, can be used. According to various embodiments, the field lens and/or the vial lenses, can each include two or more lenses that effect the required focusing. The word “lens” herein can include such multiplicities of lenses. According to various embodiments, a light source  11 for a source beam 20 of light can be provided. The light source can provide a flood light, for example, a 100 watt halogen lamp. The light source can provide light at selective wavelengths, incoherent or incoherent. According to various embodiments, the light source can be mounted at a focal distance of an ellipsoid reflector 11 a which can produce a relatively uniform pattern over the desired area. According to various embodiments, the reflector can be dichroic. The dichroic reflector can, for example, substantially reflect visible light and transmit infrared light, to restrict infrared from the other optical components, and from overheating the instrument. The cooling of the instrument can be aided by a heat reflecting mirror 13 in the optical path. A mechanical or electronic shutter 12 can be used for blocking the source beam of the light source for obtaining dark data. The type of light source can be a projection lamp, or a laser, with appropriate optical elements. According to various embodiments, a beam splitter  6 can be disposed to receive the source beam 20. In the present embodiment this can be a dichroic reflector positioned, for example, at 45°, to reflect light including an excitation frequency that can cause the marker dye to fluoresce at an emission frequency. The dichroic reflector can pass light including the emission frequency. Such a conventional optical device can utilize optical interference layers to provide the specific frequency response. According to various embodiments, the beam splitter can be positioned to reflect the source beam to the folding mirror. The source beam can be reflected from the splitter as an excitation beam  22 including substantially the excitation frequency. The excitation beam can be focused by the field lens 3 and then as separated beams 24 by the vial (well) lenses 2 b into the center of the vials. The marker dye can be thereby caused to emit light at the emission frequency. This light can be passed upwardly, as depicted in FIG. 1, as an emission beam in the form of individual beams 26. The individual beams 26 can be reflected from the folding mirror 5 to the beam splitter 6, which can pass the emission beam through to a detector 10. According to various embodiments, the vial lenses  2 b and the field lens 3 can together constitute a primary focusing device for focusing both the excitation beam and the emission beam. According to various embodiments, the field lens can be omitted from the focusing device. According to various embodiments, the vial lenses can be omitted from the focusing device. In another embodiment, an objective lens in the field lens position can be used to focus the individual emission beams on the detector. According to various embodiments, the beam splitter  6 can pass the source beam as an excitation beam and reflect the emission beam, with appropriate rearrangement of the lamp and the detector. Angles other than 45° can be used depending on the beam splitter utilized. The beam splitter can be used to form a more perpendicular reflection and pass through. The beam splitter can split the optical paths for the excitation beam and the emission beam. Other variations known in the art that achieve this can also be suitable. The dichroic device can help minimize the source light reaching the detector. A can also be used. The non-dichroic beam splitter can be less efficient as significant amounts of source light are reflected or transmitted in the wrong direction, for example, to the detector, and/or lost. According to various embodiments, to further filter the source light, an excitation filter  7 can be disposed between the light source 11 and the beam splitter 6. This can pass light including the excitation frequency while substantially blocking light including the emission frequency. Similarly, an emission filter 8 can be disposed between the beam splitter and the detector, in this case between the splitter and a detector lens 9 in front of the detector. This filter can pass light including the emission frequency while substantially blocking light including the excitation frequency. FIG. 1 a is a bottom view that illustrates an OLED layout 400 that can be used as a light source, together with a plurality of photodiode detectors 412, according to various embodiments. The OLED layout 400 can include a plurality of OLED well lamps 402, each positioned, when in operation, above a respective well of a multi-well sample well array. Each OLED material well lamp 402 can be connected to, or integrally formed with, a respective connection arm 404 that leads to a layout terminal 406. Each layout terminal can be connected to or integrally formed with the respective connection arms 404 branching from the layout terminal. According to various embodiments, the connection arms  404 can branch off of side terminals 406 and 408. The OLED layout can be connected to respective opposite electrical connections, for example, opposite terminals of a power supply. The OLED layout can be connected to the power supply through leads arranged at opposite comers of the OLED layout. The power supply can include or be connected to one or more of a switch, a meter, an oscillator, a potentiometer, a detector, a signal processing unit, or the like. Alternatively, or additionally, connection arms 404 can each include a wire or electrical lead in the form of, for example, a metal wire. The OLED layout can include a plurality of individually addressable OLED lighting elements (not shown) with a separate lead connected to each lighting element. The wiring, leads, terminals, connection arms, and the like can be implemented in, for example, a substrate or a film. An OLED layout control unit 410 can be used to supply power and control the OLED layout 400. A plurality of detectors 412 can be electrically connected to a detector control unit 416 through respective detector leads 414 as shown. According to various embodiments, the plurality of detectors can be arranged, for example, centered, on the plurality of OLED well lamps  402, on the sides of well lamps that face respective sample wells, and/or when operatively positioned adjacent a multi-well sample well array. The detectors can be configured to detect light emitted from the sample wells of a sample well array, without being flooded or bleached out by the respective OLED well lamps. For example, a mask material can be disposed between the detectors and the respective OLED well lamps. The detector 412 can be formed in the same substrate as the OLED lamp. According to various embodiments, the exemplary OLED layout shown in FIG. 1 a is shaped to be aligned with a 24 well sample well array. Other embodiments of OLED layouts using various shapes and various numbers of well lamps are within the scope of the present teachings. According to various embodiments, each well lamp  402 can include, for example, four individual lamps or OLED layers, capable of producing excitation wavelengths at four different frequencies. FIG. 1 b illustrates an exemplary embodiment of a light source layout. An OLED layout 450 can include varying color OLEDs 452, 454, and 456 stacked upon each other. The layout can be useful for a compact light source design capable of forming excitation beams at varying wavelengths. The OLEDs 452, 454, and 456 can be transparent, allowing excitation beams from each OLED to pass through any other OLED so as to be directed towards a sample. The OLEDs 452, 454, and 456 can emit different colors, same colors, or a combination thereof depending on the color intensity and variety required. The OLEDs 452, 454, and 456 can share an electrode, for example, a cathode. One electrode, for example, an anode, for powering each of the OLEDs 452, 454, and 456 can be connected in electrical isolation from each respective anode to a control unit (not shown) if the capability to independently activate each of the OLEDs 452, 454, and 456 is desired. The OLEDs 452, 454, and 456 can electrically share one electrode, two electrodes, or no electrodes. Any number of OLEDs can be stacked, for example, two OLEDs, three OLEDs, four OLEDs, or more OLEDs, to form a light source, a respective light source, or an array of light sources. According to various embodiments, the beam splitter  6, the excitation filter 7 and the emission filter 8 can be affixed in a module 30 (FIG. 2) that can be associated with a selected primary dye for the suspension. The module can be removable from the housing 32 of the instrument A for replacement with another module containing different beam splitter and filters associated with another selected primary dye. The instrument can include a lamp subhousing 33 and a camera subhousing 35. In an example (FIG. 3), and according to various embodiments, each module can include a mounting block  34 with a flange 36 that can be affixable to the housing with a single screw 38. The beam splitter 6 can be held at 45° in the block with a frame 40 and screws 42. The emission filter 8 can mount, for example, with glue, into the block. The excitation filter 7 can be similarly mounted into a mounting member 44 that can be held by screws 46 to the block. With the module in place, the instrument can be closed up with a side plate 47 that can be screwed on. Positioning pins (not shown) ensure repeatable alignment. The replacement module can include the same mounting block and associated components, with the beam splitter and filters replaced. According to various embodiments, the detector lens  9 (FIG. 1) can be cooperative with the vial lenses 2 b and the field lens 3 to focus the individual beams on the detector 10. The lens can be large aperture, low distortion, and minimum vignetting. According to various embodiments, a detector with a multiplicity of photoreceptors (pixels)  78 can be preferable if there is a plurality of vials. The detector can provide separate monitoring of each vial. In another embodiment, a scanning device can be used with a single photodetector, for example, by scanning the folding mirror and using a small aperture to the detector. A simple device such as a photomultiplier can be used, if there is only one vial. A CCD can receive light for a selected integration period and, after analog/digital conversion, can read out digital signal data at a level accumulated in this period. The integration can be effectively controlled by an electronic shutter. A frame transfer circuit can be desirable. Signal data can be generated for each pixel receiving the individual beams of emitted light from the vials. According to various embodiments, the instrument can include a fluorescent reference member  4 that can emit a reference light in response to the excitation beam. The reference member can be formed of a plurality of reference emitters, for example, 6, each emitting a reference beam of different intensity in response to the excitation beam. The range of these intensities can approximate the range of intensities expected from the marker dye in the vials; for example, each segment can be separated in brightness by about a factor of 2.5. The reference member can be disposed to receive a portion of the excitation beam from the beam splitter. A good location for the reference member can be adjacent to the field lens, so that the optical paths associated with the member approximate those of the vials. Most of the reference light can pass back through the beam splitter as a reference beam to the detector. The detector pixels can receive the emission beam to generate reference signals for utilization along with the data signals in the computing of the concentration of the nucleic acid sequence. According to various embodiments, the reference member  4 (FIG. 4) can include a plastic fluorescent strip 4 a. The reference member 4 can include a neutral density filter 4 b mounted over the fluorescent strip 4 a. The reference member 4 can include an air space 4 h the fluorescent strip 4 a, such that a portion of the excitation beam and the reference beam can be attenuated by the neutral density filter. The neutral density filter can have a series of densities 4 c to effect the plurality of reference emitters (segments), each emitting a reference beam of different intensity. A heating strip 4 d and an aluminum strip 4 g can be mounted in a trough 4 e on the bottom thereof, as depicted in FIG. 4, to smooth the heating. The fluorescent strip can be mounted on the aluminum strip over the heating strip. To prevent heat loss, this assembly can be covered by a transparent Plexiglas window (not shown, so as to display the varying density filter). To help maintain constant fluorescence, the heating strip can be controlled to maintain the fluorescent strip at a constant temperature against the thermal cycles of the cycler block and other effects. This can be done because most fluorescent materials change in fluorescence inversely with temperature. According to various embodiments, the computer processor  14 (FIG. 1) can be a conventional PC. The computer programming can be in conventional computer language, for example, “C”. Adaptations of the programming for the present teachings can be readily recognized and achieved by those skilled in the art. The processor can selectively processes signals from pixels receiving light from the vials and the reference emitters. The processor can selectively ignore surrounding light signals. According to various embodiments, the programming can include masking to define the pixel regions of interest (ROI), for example, as disclosed in co-pending provisional patent application serial No. 60/092,785 filed Jul. 14, 1998 of the present assignee. Mechanical alignment of the optics can be necessary to cooperatively focus the beams into the programmed regions of interest. The analog data signals can be fed to the processor through an analog/digital (A/D) device 15 which, for the present purpose, can be considered to be part of the processor. A saturation level can be proscribed by the detector, the A/D, the CCD dynamic range, or a combination thereof can be matched to the A/D dynamic range. A suitable range can be, for example, 8 bits of precision (256 levels). The CCD amplifier offset can be set so that the dark signal output of the CCD (with the shutter 12 closed) can be within the A/D range. The processor can instruct the detector with selected exposure time to maintain the output within the dynamic range. In operation, fluorescence data can be taken from the plurality of vials (e.g. 96 regions of interest) and from the reference emitter segments, for each cycle in a nucleic acid sequence replication reaction. For PCR, the number of thermal cycles can be from about 40 cycles to about 50 cycles. Two data sets can be taken (FIG. 5) for each cycle during the extension phase of the PCR reaction at about 60° C., which can be the phase where all of the nucleic acid sequence strands have recombined into double strands. One set can be normal primary data  50 (along with reference data described below) and the other set can be dark signal data 51 with the mechanical shutter closed. Both digital data sets 50, 51 can be converted by the A/D 15 from respective analog data signals 48, 49 from the detector. The dark can be subtracted 55 from the normal, to yield dark-corrected data 57. In a simple procedure, the subtraction can be pixel by pixel. According to various embodiments, total dark for each region of interest can be subtracted from corresponding total fluorescence data. In another embodiment, multiple exposures can be collected during each exposure period, for example, 4 or 8 exposures, in order to increase the effective dynamic range of the instrument. This can be done by collecting multiple normal exposures and dark signal data for each pixel, subtracting each respective dark image from the normal data, then adding the subtracted data together to yield the primary data. This can improve the statistical validity of the image data and increases its effective dynamic range. Data can be taken simultaneously from the reference strip which includes, for example, 6 segments together with the 96 vials for a total of 102 regions of interest. According to various embodiments, the processing device can provide for automatic adjustment of the exposure time to maintain the data signals within a predetermined operating range that can be less than the saturation limit during the nucleic acid sequence replication sequence, for example, 35% to 70% of saturation. Computations for nucleic acid sequence concentration can include corrections in proportion to adjustments in exposure time (FIG. 6). Signal data  50, 51 from each exposure 52, 53 can be obtained during a previously determined exposure time 54 by totaling the pixel counts within each region of interest (ROI). To provide the time adjustments, the highest signal data  56 can be searched out 58 from the corresponding data signals 50. The highest signal data 56 can be data from one or more of the highest pixel readings, such as the three highest contiguous pixels. It can be determined from a comparison 62 whether the highest signal data can be less than, within, or higher than the selected operating range 60. Based on such determination, the exposure time can be adjusted 64, i.e. increased, retained, or reduced, to obtain the subsequent exposure time 66. A reference time 68 (FIG. 5) can be selected which can be, for example, an initial time or a fixed standard time, for example, 1024 ms. The dark-corrected data 57 can be time-corrected 69 to yield corrected primary data 71, that can be divided by ratio of actual exposure time to the reference time. The first several cycles can be out of range, and thereafter a useful fluorescence curve can be obtained (FIG. 7). According to various embodiments, for the reference emitter, the pixels receiving light from the reference strip  4 (FIGS. 1 and 4) reference data signals 73 can be generated and can be converted by the A/D 15 to reference data 72. Selected reference data 74 from a specific reference segment 4 c (FIG. 4) can be selected 76. Reference data 74 can have the highest signal strength that can be less than a predetermined maximum 77 that, in turn, can be less than the saturation limit, for example, 70%. A next dimmer segment can be also selected 75, and the selected reference data 74 can include the data from that segment. The dark data 51 can be subtracted 78 from the reference data 74, and the dark corrected data 80 can be adjusted 84 for exposure time 54 to yield adjusted reference data 82. According to various embodiments, the data  82 can include dark corrected data 82′ for the highest segment and dark corrected data 82″ for the next dimmer segment (FIG. 9). The ratios of brightness between each segment can be computed 89 and can be built up over the course of data collection. Each time data is collected, the ratio between the highest and next dimmer segment can be calculated. As different optimum segments can be selected on succeeding data collections, a table of ratios 85 can be assembled. According to various embodiments, these ratios can be collected and calculated in advance. This adjusted reference data 82′ (from data 82, FIG. 5) can be utilized for computing normalized reference data 88 which can be normalized 86 in real time as a ratio to reference data 90 from an initial or other selected previous cycle in the nucleic acid sequence replication sequence by working back with the ratios 85. The normalized reference data can be utilized on the corrected primary data 71 in a normalization computation 92 to provide drift normalized primary data 94 by dividing the primary data by the normalized reference data. This can correct for instrument drift during the monitoring. Nucleic acid sequence concentration 96 can then be computed 98 from a stored calibration factors 99, and can be determined by running standard known nucleic acid sequence concentrations to determine the slope and intercept of a line relating starting concentration to the starting cycle of the growth curve (FIG. 7) as taught in the aforementioned article by Higuchi and U.S. Pat. No. 5,766,889. Further normalization 118, 120 and baseline correction 122-130 are discussed below. Illustrating operation for the denature phase (FIG. 8), respective normal and dark data signals  102, 104 can be obtained in the same manner as for the primary data, with normal exposure 52′ and closed shutter 53′. Exposure time 106 can be the same as for an adjacent extension phase in the sequence, or can be determined from a previous denature phase run (as described with respect to FIG. 7), or can be a predetermined suitable time for all denature phases in the sequence. The A/D 15 can convert the signals to secondary data 108 and dark data 110. The dark can be subtracted 55′ from the secondary to yield dark-corrected data 112 which can be further corrected 69′ with a reference time 114 and the actual exposure time 106 that can yield corrected secondary data 116. The extension cycle, drift normalized primary data  94 then can be normalized 118 by dividing by the average of a selected number of cycles, for example, 10, for the denature phase corrected secondary data 116 that can produce further normalized fluorescence data or further normalized data 120, which can remove sample well to well non-uniformity effects. Cycle by cycle division can be used in place of an average. According to various embodiments, the secondary data can be applied to the corrected primary data 71 before or after drift normalization. Baseline samples can be selected 122 and can be averaged 124 to produce baseline data 126. The further normalized data 120 can be then divided 128 by the baseline data to yield baseline corrected data 130. These baseline samples can be selected so as to be before the PCR growth exceeds the nearly horizontal base line portion of the curve in FIG. 7. Selected baseline cycles can be, for example, cycles 6 through 15. After further normalization 118, the further normalized data 118 can be used to compute 98 a DNA concentration 96. The trend of these same baseline samples, for example, least squares regression line, can be subtracted from the normalized extension cycle data, to produce data that can include a flat base line at zero. This data set can then be processed using established or other desired amplification methods to calculate the amount of starting copies of an nucleic acid sequence. A simple procedure can be to extrapolate for the inflection point at the transition from flat to rising. A more sophisticated procedure is described in the aforementioned U.S. Pat. No. 5,766,889. FR2672128B1 (en) 1991-01-28 1995-08-18 Cis Bio Int Method for measuring the luminescence emitted in a luminescent assay.